An original CDV photograph measuring approximately 2 3/8 x 4 1/16 inches. After he studied business in Frankfurt, Sommer then opened his first photography studio, during which time he worked in Switzerland, where he made relief images of mountains for the Swiss government. In 1856 Sommer moved to Naples and in 1866 he formed a partnership with fellow German photographer Edmund Behles (also known as Edmondo Behles), who owned a studio in Rome. Operating from their respective Naples and Rome studios, Sommer and Behles became one of the largest and most prolific photography concerns in Italy. Active from 1857 to 1888, Sommer produced thousands of images of archeological ruins, landscapes, art objects and portraits and thus became one of Europes most important and prolific photographers of the 19th century. Sommers catalog included images of artworks from the Vatican Museum, the National Archeological Museum at Naples and the Roman ruins at Pompeii, as well as street and architectural scenes of Naples, Florence, Rome, Capri and Sicily. In April 1872, he documented a very large eruption of Mount Vesuvius in a series of stunning photographs. Sommer and Behles exhibited extensively and earned numerous honors and prizes for their work (London 1862, Paris 1867, Vienna 1873, Nuremberg 1885). The partnership with Behles ended in 1874, after which each photographer continued his own business. In Naples, Sommer opened a total of four additional studios: at No. 8 Monte di Dio, No. Caterina, and a last at Piazza della Vittoria. Sommer died in Naples in 1914. At one time, Sommer was appointed official photographer to King Victor Emmanuel II of Italy. Sellers: Get your own map of past buyers. 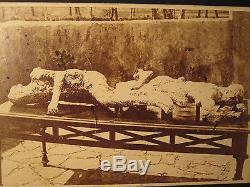 The item "ANTIQUE CIVIL WAR ERA 1863 POMPEII POST MORTEM CAST GIORGIO SOMMER CDV PHOTO" is in sale since Wednesday, May 4, 2016. This item is in the category "Collectibles\Photographic Images\Vintage & Antique (Pre-1940)\CDVs". The seller is "theprimitivefold" and is located in Oak Lawn, Illinois. This item can be shipped to United States, Canada, United Kingdom, Denmark, Romania, Slovakia, Bulgaria, Czech republic, Finland, Hungary, Latvia, Lithuania, Malta, Estonia, Australia, Greece, Portugal, Cyprus, Slovenia, Japan, China, Sweden, South Korea, Indonesia, Taiwan, South africa, Thailand, Belgium, France, Hong Kong, Ireland, Netherlands, Poland, Spain, Italy, Germany, Austria, Israel, Mexico, New Zealand, Philippines, Singapore, Switzerland, Norway, Saudi arabia, United arab emirates, Qatar, Kuwait, Bahrain, Croatia, Malaysia, Brazil, Chile, Colombia, Costa rica, Dominican republic, Panama, Trinidad and tobago, Guatemala, El salvador, Honduras, Jamaica.